WATERSOUND, Fla.--(BUSINESS WIRE)--St. Joe Resort Operations, LLC, a subsidiary of The St. Joe Company (NYSE: JOE) (“St. Joe”) today announced the WaterColor Inn and The Pearl Hotel—two properties in the St. Joe Club and Resorts collection—as Best Waterfront Resorts in USA TODAY’s 10Best Readers’ Choice Awards 2018, which highlights America’s top travel destinations, attractions, and restaurants, as rated by the public. Nominees were chosen by a panel of relevant experts, which include editors from USA TODAY, editors from 10Best.com, relevant expert contributors, and sources for both these media and other Gannet properties. The WaterColor Inn and The Pearl Hotel are a part of St. Joe’s larger portfolio of properties owned and/or operated under the St. Joe Club & Resorts brand. Other properties include private access beach clubs, golf clubs and marinas. St. Joe provides access to some of these amenities through its private membership club, The Clubs by JOE, offering its members a variety of one-of-a-kind amenities and experiences showcasing the best the area has to offer. The Clubs by JOE is seeking to expand its portfolio of assets giving club members access to new and exciting amenities throughout the region. 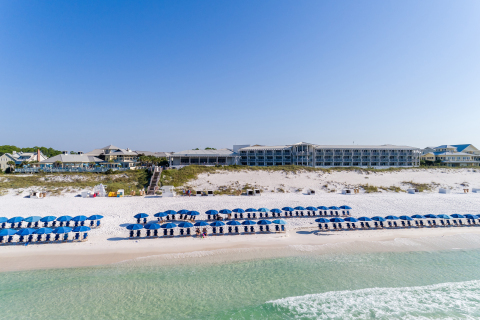 Nestled on nearly 500 acres of sugar-white sand beach, WaterColor Inn, which placed 4th out of 20 award nominees, is surrounded by 1,400 linear feet of beachfront and pine trees alongside Western Lake, the state’s second-largest naturally occurring coastal dune lake. This 60-room Inn offers deluxe accommodations designed by David Rockwell, each overlooking the Gulf of Mexico and featuring a pair of Adirondack chairs on the patio (and on the first floor, a private outdoor cabana shower). Perfectly encapsulating the spirit of an intimate beach getaway—while providing the functionality necessary for a family vacation—the beachfront rooms bring the outdoors in, mere footsteps from the sand. From the soft linens to the spa-inspired toiletries, every well-appointed room offers a relaxing and comfortable seaside oasis. Additionally, the property’s newly renovated flagship restaurant, FOOW, offers seasonal coastal cuisine, and one of 30A’s most expansive Gulf views. 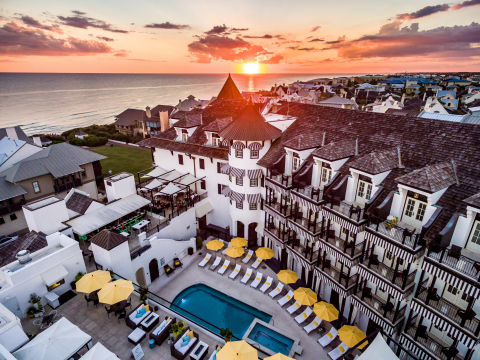 Located in the quaint, eclectic coastal town of Rosemary Beach, The Pearl Hotel, which placed 10th out of 20 award nominees, is an intimate, 55-room boutique hotel that celebrates the town’s distinct Southern charm. In addition to its elegant aesthetics, this hidden gem features guest services-integrated iPads, an award-winning restaurant, Havana Beach Bar & Grill, and rooftop lounge in homage to Hemingway’s favorite haunt in Cuba, as well as the poolside Spa Pearl. Surrounded by unique architecture in a West Indies-inspired destination established as an upscale retreat for urbanites, guests are encouraged to explore the intriguing area by foot or bike. Rooms provide a private balcony with views of the Gulf of Mexico or surrounding Rosemary Beach, with artistry from the town showcased throughout the hotel. Perfect for romantic getaways, this AAA Four Diamond and Forbes Four Star property leaves guests revived, inspired, and dreaming of their next beachside visit. St. Joe Club & Resorts is a collection of upscale accommodations and amenities, as well as a private membership club. Spread along a 26-mile stretch of Scenic Highway 30A and throughout Northwest Florida’s Emerald Coast, the portfolio currently includes: WaterColor Inn, The Pearl Hotel, WaterSound Inn, Origins Golf Club, Bay Point Marina, Port St. Joe Marina; as well as WaterSound Beach Club, Shark’s Tooth Golf Club and Camp Creek Golf Club offered through The Clubs by JOE. For more information, visit www.stjoeclub.com. WaterColor Inn, which has maintained a Four Diamond rating from AAA since 2007; achieved a four-time, four-star rating from Forbes Travel Guide; was named a Top Resort in Florida in the 2017 Condé Nast Traveler Reader’s Choice Awards; and claimed a spot on U.S. News & World Report’s “Best Hotels in the USA” list. The property offers luxurious accommodations and corporate meeting spaces at the exclusive 60-room Inn. The hotel features three on-site restaurants including the newly renovated FOOW, a full-service spa, and an adults-only pool, as well as access to additional resort amenities including five pools, a private beach club, and tennis courts. WaterColor Inn was developed by The St. Joe Company, affording guests access to the many amenities and activities offered through a private membership club. For more information, visit www.watercolorresort.com or call 1.855.788.2782. The Pearl Hotel is an intimate, 55-room boutique hotel that opened in August 2013 and is managed by St. Joe Club & Resorts. The AAA Four Diamond and Forbes Four Star property features elegant furnishings, guest services-integrated iPads, the poolside Spa Pearl, and an onsite destination restaurant with rooftop lounge. It maintains an upscale, modern personality within the West Indies-inspired town that’s pioneering the new urbanism ‘walkable cities’ movement, encouraging guests to explore the region on foot or by bike. Each room provides a private balcony with Gulf of Mexico or quaint beachside town views. Perfect for romantic getaways, this indulgent hotel leaves guests revived, inspired, and dreaming of their next visit. For more information, please visit www.thepearlrb.com or call 1.888.656.6463. ©The St Joe Company 2018. “St. Joe®”, “JOE®”, the “Taking Flight” Design®, “St. Joe (and Taking Flight Design) ®”, “WaterColor Inn®” and other amenity names used herein are service marks of The St. Joe Company or its affiliates. The Pearl Hotel is a service mark of The Pearl on 63 Main, Ltd.